I’m offering the “How to Brew All Grain” and “How to Brew Extract” DVDs on sale for $14.95 when you order from Amazon Prime through 1 September 2015. This is an amazing deal on these professionally shot videos done with co-host John Palmer, author of the popular How to Brew book. The special price applies only to DVDs ordered through Amazon. 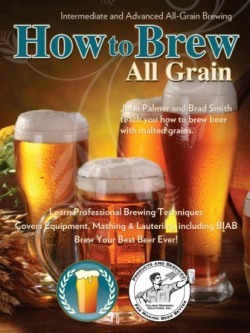 How to Brew All Grain DVD Sale – $14.95 for DVD version through 15 August! Have you ever wanted to brew great beer at home? How to Brew with Malt Extract is an introduction to home brewing that takes you from purchasing your first equipment and ingredients to bottling and sampling your beer. Featuring two of the best known authors in the brewing community, this video is cinematically filmed with hundreds of detailed shots showing every step in the process. Covers equipment needed, ingredients, brewing, fermenting, bottling and judging your beer using extract and partial mash techniques. Professionally filmed in HD with hundreds of shots showing every step in the brewing process. Also includes four bonus videos on partial mash brewing, yeast starters, water and late extract methods. (70 Minutes, Widescreen) On sale now in DVD format on Amazon Prime! 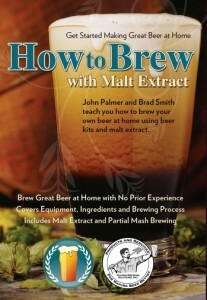 How to Brew with Malt Extract DVD Sale – $14.95 for the DVD from Amazon!